It’s not what you think. Even if you didn’t think it before, you may be thinking it now, because I brought it up, but it’s still not what you think. Several months ago, fellow blogger and veteran Kristina Evans authored a post about how to transition from one position to another, and make sure that you don’t leave any mess behind for someone else to clean up. She was inspired to do so by a sign in a bathroom, “Please Flush Toilet Before Leaving the Stall.” Leaving aside the puns and scatological wordplay, the post reminded me of lessons learned from another sign in a bathroom a long way away. This has got to be stock art. No latrine I ever went to in Iraq was this nice. -ed. For those of you who are not familiar with military deployments, the bathroom situation is usually interesting. 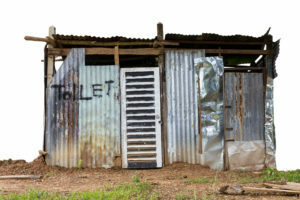 It is not often that the bathroom (or “latrine” or “head” or several other euphemisms less acceptable in polite company) is actually in the same building or area that you sleep in. In Iraq in 2006, my unit was stationed on a Forward Operating Base in Northeast Baghdad. We lived and worked in a two-story dormitory style building that was one of a series of three. In between our building and the one next to it was a latrine trailer and a shower trailer, one each for both male and female Soldiers. Think of a fifth-wheel mobile home, only filled with toilet stalls and showers. This arrangement was shared by several different units, probably about three to four hundred of us. Another interesting fact about military service members: we get bored easily, and find strange and interesting ways to amuse ourselves. In regards to this particular latrine, one of the ways that our Soldiers found to amuse themselves was graffiti. Lots of it. So much graffiti that one could literally spend hours reading the musings and thoughts of combat veterans deployed to a faraway land. To be honest, much of it was funny, as graffiti written by combat veterans is likely to be. Lots of stuff about good ol’ Chuck Norris. A lot of it wasn’t funny, though. It started to get to the point where the graffiti in the male latrine started causing tension between people, the anonymity afforded by the bathroom wall bringing out the worst them, just like the anonymity and lack of face-to-face feedback sometimes brings out the worst in people on social media. So I decided to do something about it. First, get rid of the graffiti. This was one of the first challenges, and why it got out of control; the command thought, “well, if we clean it off, it will just come back, so there’s no point.” Lesson one:if you think there’s no point in doing something, then there’s no point in doing something. Don’t accept a problem because you don’t think there’s a solution. Figure it out. So I made sure we could get it gone, and one of my subordinates spent a night scrubbing the walls. He said he enjoyed it, called it “meditative.” Just goes to show you how boring things can sometimes get while on deployment. ONLY COWARDS HIDE BEHIND WORDS WRITTEN ANONYMOUSLY ON WALLS. IF YOU FEEL LIKE YOU NEED TO READ SOMETHING, LOOK TO YOUR LEFT AND YOUR RIGHT AND BE REMINDED OF THE PROFESSIONAL THAT YOU ARE. This was honestly an attempt by me to use my position in my unit to influence behavior, and not be a coward by not putting something on the wall anonymously. Amazingly, to my surprise, it worked. Lesson number two: even if you have a hairbrained scheme that has no chance of working, give it a shot. You never know. This experience reminded me of the broken window theory, in that an abandoned building without broken windows will likely remain intact until someone breaks a window. There is something about taking that first action to break a window that will keep most in society from doing it. Once the first window is broken, however, there seems to be a taboo that is broken as well, and others find it easy to break more windows. That’s how it got with our bathroom graffiti: once it was acceptable, and nothing was done about it, it became more acceptable. When it was removed, it was much easier to maintain; sure, sometimes the signs were torn off, and sometimes someone wrote on the wall again, but someone else always told us about it and it was taken care of quickly. Lesson number three: sometimes solving a problem means maintaining the solution, not walking away considering the problem done. Interestingly enough, that wasn’t the end of the story. Some time later, I was walking back to my building and heard someone calling my name. This guy runs up to me, and I look at him, wondering if I knew him. “Sergeant France, there you are!” he said. I looked at his name, his unit. “Do I know you?” I said. “My Battalion Commander’s an @!#*(#$,” he said. I waited for him to continue. “Not really, it’s just the Army,” he said, then waved at me and walked down the street. Now, I get it, this was just a young sergeant being a smartass. A goofy kid poking the bear a little bit, trying to break up the monotony of base life while blowing off a little steam. That got me to thinking, though; why can’t there be more of that? Organizations have their own internal investigative units that make sure that policies are being adhered to, but what if different organizations teamed up to allow people to blow off steam? I mean, it didn’t matter to ME that he thought his Battalion Commander was a jerk. I was pretty well satisfied with mine. It’s as if the guy that delivers sandwiches to our office now would come in and say, “man, I really hate working for Jimmy Johns. I just don’t like being so fast all the time.” No sweat off my back, just takes a bit of my time and lets him blow off some steam. Lesson number four: always be flexible enough to respond to unintended reactions to your solution. You may find benefits that you didn’t expect. So there you have it. Four lessons from a bathroom stall in Iraq. Maybe it was what you thought, after all. But I doubt it. Duane K. L. France is a retired Army Logistics NCO, combat veteran of Iraq (x1), Afghanistan (x2), Bosnia back in the last century, and spent some time in North Africa in support of 10th Special Forces group at the end of his career. While in the Army, he was focused on the accomplishment of his mission and the welfare of his Soldiers; after retirement, he decided that his mission was the welfare of his Soldiers and became a clinical mental health counselor practicing in Colorado Springs, Colorado. In addition to working as a counselor to justice-involved veterans, he writes for a wider audience on his website, www.veteranmentalhealth.com. This article first appeared on that site, and is used here with permission.